Ever dreamed that you could completely trust your dog while they were off leash?? While at your house, out on a hike, or even at the dog park? Ever wished your dog came when you called its name the first time?? Or even stay still for a picture?? The e-collar tool is included in the price. These lessons are extremely important to teach YOU how to work with your dog properly and be 100% comfortable using the E-collar. The Electric Dog training collar is NOT a “shock collar”, it gives off a very gentle stimulation, is extremely consistent, water proof, has a half-mile radius range and is rechargeable. Not only that, we will also train your dog to respond on low levels, levels that can barely be felt on a person’s hand, so your dog is not getting injured. We teach you how use the E-collar system and answer all your questions you have about this wonderful training tool. We take the time to teach your dog to respond to the lowest level possible on the e-collar. The main goal with this training is we will teach your dog how to be off-leash reliable, come when called, or be by your side, even when there are distractions around! All dogs love to run and move… So why not let them have some fun while being under control and sage at the same time?! 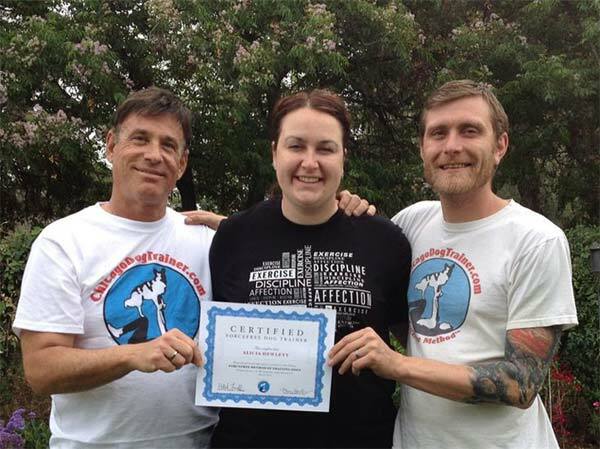 Alicia has been certified in the ForceFree Method of Remote Collar Training by ChicagoDogTrainers; Marc Goldberg & Patrick Farrell. The ForceFree Method™ is an intuitive system of training that makes sense to both people and dogs. Effective and gentle, the training method works with the dogs instincts rather than against them. We achieve off leash reliability, even with distractions, amazingly fast. Most dogs perceive the training as simple “pack cooperation” and play. Therefore, they quickly shed rebellious behavior, and give you more focus than you imagined possible. Doesn’t that sound like more fun than correction after correction?